Jeff Koons: Now, Newport Street Gallery, until 16th October, free. Jeff Koons is an artist who critics seem to either love or hate. If you’ve heard of him, it was probably in the context of “is it even art?” discussions. Certainly there’s something about his story – a man who worked as a stock broker must know the value of art. Oh, and this is Damien Hirst’s gallery, and there’s a lot that may be said about him. But if you’re in London over the summer, you have the opportunity to go, see, and make up your own mind. Whether he’s just about the money or not, Koons is clearly tuned in to the things which make modern society tick. Status, consumerism, desire – themes my thoughts kept returning to throughout the show. 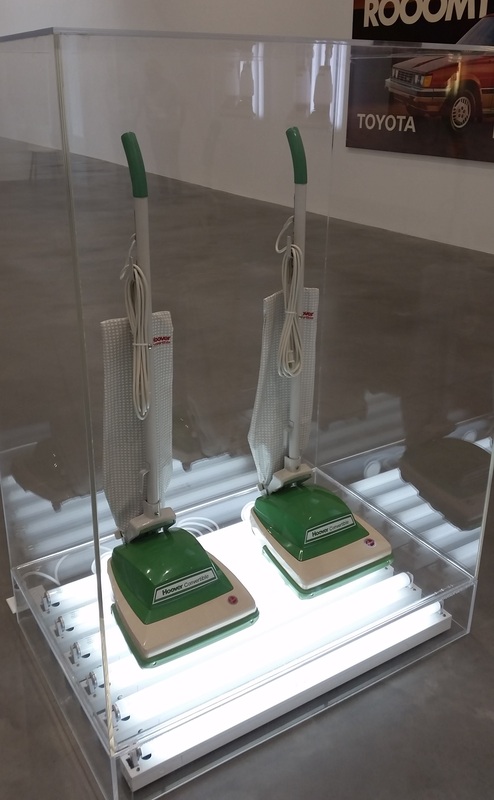 This strikes you from the minute you step into Gallery 1 and are confronted with Hoovers. Pristine, straight-from-the-box, unused Hoovers, the type which somebody might be proud to own. Were they not 30 years out of date. They weren’t the latest model even when they were first exhibited. Status doesn’t last, but people will keep chasing after the latest thing, in a permanent quest for a perfection which objects can never really deliver. Maybe Koons is as calculating and cynical as some people suggest because Gallery 4, I felt, was recognising that modern life is lying to you. I understand and sympathise with people who ask where the artistic merit of putting adverts into frames is – if it were on its own, I’d agree. But exhibited alongside Three Ball 50/50 Tank, they tell a story. The basketballs only float in the water because Koons consulted Feynman on the exact solution for the water. The dream that Nike are trying to sell – wear trainers and achieve greatness – isn’t as simple as that. Greatness can be achieved, but it takes a bit of work. The other word I kept thinking of was sensual – I wanted to touch pretty much everything I saw. Koons’ reputation has partly been based on his inflatables, some of which are real, but most of which are made of metal. This not only means they can be preserved forever, but also makes them extra shiny and appealing. Knowing that they’ve been painted to be so lifelike makes me want to touch them even more, to prove that that’s the case. This sensual quality makes you almost forget to ask the question of whether it means anything or even if that matters – isn’t one of the purposes of art to be a ‘beautiful thing’? If so, many pieces in this exhibition deliver in spades. Certainly I don’t agree with one reviewer who said that this is art which is “empty of emotion” because although it’s not especially deep, I had a lot of fun with his work. One of the stand-outs of the show is Play-Doh, a life size recreation of a sculpture made by his young son. As well as attracting you with the sensual quality of ‘squeezability’, I thought of it as a ‘Celebration’ (as the series is called) of childhood fun. You may see it as trite and pointless but to a child, those forms mean something, and that sense of fun, creation and experimentation is worth celebrating. Am I reading too much into all of this? Maybe. Koons has said about his own art that art “is not about the objects – they’re just carriers of the ability to stimulate and activate the viewer’s mental and physical state“. So maybe this is all my interpretation of things which aren’t really there. Maybe, as his critics say, it’s all playing into the modern model of art having meaning purely through money. But I know what I feel and, as I said at the start, I’m glad that this exhibition gave the chance to make my own mind up. Don’t take my word for it, go and do the same yourself. This entry was posted in Exhibitions, Home, On my travels, Past exhibitions and tagged art, contemporary, Koons, London. Bookmark the permalink.